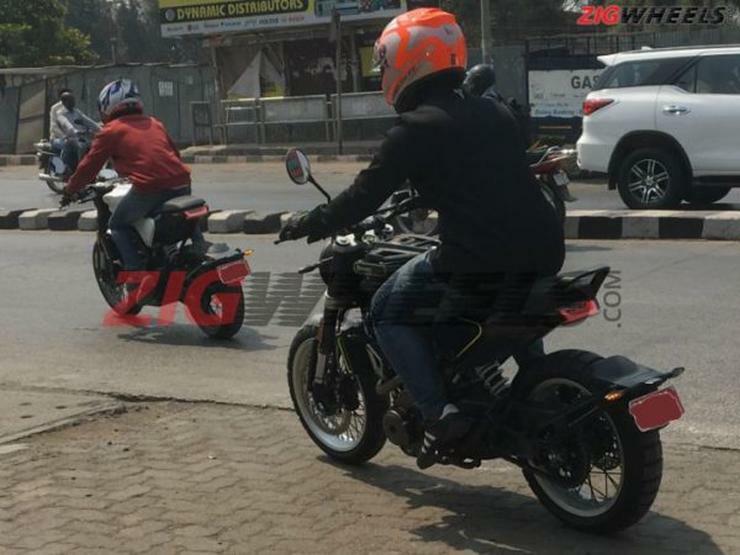 Husqvarna has started testing the Vitpilen and Svartpilen 401 on Indian roads. These are two brand new retro motorcycles that are based on the KTM Duke 390 platform. Husqvarna is a Swedish motorcycle brand now owned by KTM. The brand will be launched in India next year, and will first launch the Svartpilen and Vitpilen 401 – both bikes that use the 373cc engine from the Duke 390. The bikes will be built at Bajaj Auto’s Chakan factory, alongside the Duke and RC series of KTMs. These bikes are expected to be sold through KTM showrooms and also serviced at KTM authorized centers. Both the Vitpilen and Svartpilen are expected to be priced as premium alternatives to the Duke 390. The Vitpilen 401 is a cafe races styled motorcycle that is bound to appeal to those who want a retro-modern motorcycle with stunning performance. The Svartpilen 401 is a scrambler styled motorcycle that will have higher suspension travel, off road biased tyres and a more upright riding position. Both bikes are expected to be costlier than the Duke 390 but well within Rs. 3 lakhs. Bajaj and KTM are planning to target Royal Enfield buyers – who love retro bikes – with the Husqvarna small capacity motorcycles. The Husqvarnas, also called as Huskies by enthusiasts, will use the same 373cc engine of the Duke, which makes 44 Bhp of peak power and 37 Nm of peak torque. A 6 speed manual gearbox with slipper clutch will be standard. Suspension components will be shared by spring rates could be different. The bikes will also share the Duke’s frame and other cycle parts such as brakes, ABS, and even electronics. Bajaj will also export the Husqvarna Vitpilen and Svartpilen to markets around the world. This is an arrangement similar to the one that Bajaj currently has with KTM for the Duke and RC small capacity range of motorcycles, which are also exported from India worldwide. Royal Efnfield then must be a british brand i guess. Husqvarna sold the motorcycle branch decades ago and the Husky is now headquatered in Austria.